This week Network Rail and Camden's Culture and Environment Department held a very helpful briefing for local councillors and residents' groups (WHAT, LCG and CRASH) about progress with the new Thameslink Station on Iverson Road and Camden's associated improvements in Iverson Road and West End Lane. First Capital Connect representatives were also on hand to field questions, and as Georgia Graham from the Ham and High was there too, I'm sure we can expect a good piece on this in Thursday's edition. The first things to say is that the new Thameslink station (image above is from Network Rail's website) isn't scheduled to be completed until December next year, as some pretty difficult engineering is involved, although further work has now started with the final section of the new bridge finally in place. Camden's work on the adjoining part of Iverson Road, which will make it easier for passengers to cross the road well away from the junction, should be completed in a couple of weeks' time. As I've already written here, Camden's improvements to the pavements in West End Lane between Sumatra Road and Broadhurst gardens won't start until after Christmas to give us all a breather from roadworks, but I fear it will be pretty disruptive when they do start. Network Rail explained the various changes that have been made to the new station design since it was first improved, including changes to the new wall running from the station to the corner with West End Lane. It's all about saving money of course, but I think the general verdict was "it's disappointing in some respects, but we can live with it". 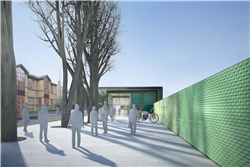 The most exciting aspect of the whole plan is the way the pavement on the north side of Iverson Road between the new station and West End Lane will be dramatically widened, with the trees in the middle of the pavements rather than tucked away behind a rather grotty fence as at present. And the demolition of the two buildings on the corner (formerly Joule - and before that Diana Frost's antique shop - and the kebab shop) while a sad loss to the local streetscape will make that corner far safer. In short, there's still a lot more to be done, including a lot more disruption at various points, which none of us will welcome, but it should all be worth it in the end. was out if town so not able to make the meeting, but will the old entrance to the Thameslink station remain, the one from Black Path? In the current economic climate, do we really need a new station building at all? Wouldn't a handful of oyster stations around the new entrance be sufficient for the time being? Sorry, only just saw these comments - yes, Natacha, the old entrance from the Black Path will still be there. I'd be interested to know what others think about Paul's comment.